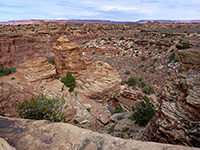 The Slickrock Foot Trail is advertised as an introduction to hiking in the Needles District of Canyonlands National Park, though at 2.4 miles (loop) it is still relatively long, taking at least an hour. The trail begins almost at the end of the scenic drive road, at Big Spring Canyon Overlook; it climbs slightly to the top of a treeless sandstone plateau then circles round the edge, past four main viewpoints, three reached by short spurs - of the main canyon to the west and an only slightly smaller tributary (Little Spring Canyon) to the east. 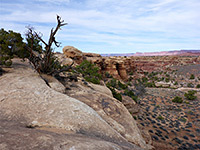 Away from the two canyons, views along the trail are of squat pinnacles and low cliffs, and across to the higher, reddish peaks of the Needles. Wildflowers, mostly small, grow in shallow hollows where sandy soil accumulates, and lizards are often seen, darting between the rocks. Both canyons are fairly shallow but deepen steadily up to their confluence, which is viewed from the third and best of the overlooks. Further downstream, the drainage soon meets Salt Creek which in turn joins the Colorado River not too far beyond, a location viewable via an off trail hike. The Slickrock loop is one of the more popular trails in this section of the park, and suitable for all seasons since although exposed there are no steep sections and the walk offers no great difficulties, even in the summer heat. Lower Big Spring Canyon, from the third overlook. Full screen version (21 mb). The Slickrock Foot Trail starts from an extended pull-out on the north side of the road, first crossing a sandy area, rising to an intermediate bench, rounding a gully and climbing a little more to the mesa top, where a junction marks the start of the loop section. Turning right, the cairned path follows the east rim for 0.3 miles to viewpoint one, the least impressive, above a low canyon to the northeast. 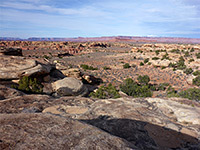 It then continues along the eastern edge, soon reaching the spur path for the second viewpoint; across a narrow saddle to a round promontory which overlooks a wide section of Little Spring Canyon, with the La Sal Mountains visible beyond, 35 miles away. 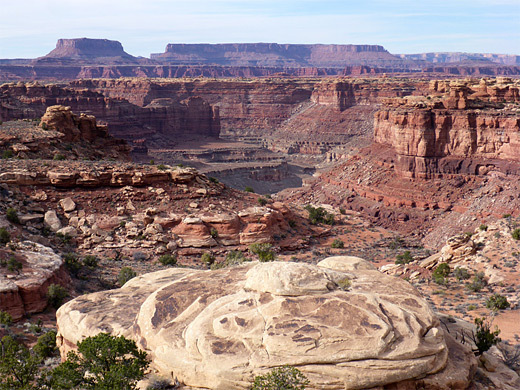 The main trail stays close to the mesa rim and after another 0.3 miles arrives at the third viewpoint, the best, looking northwards over the confluence, and down lower Big Spring Canyon towards the red cliffs and mesas beyond, some on the far side of the Colorado River. Around here the plateau surface is dotted with many shallow potholes, retaining water after rainfall. 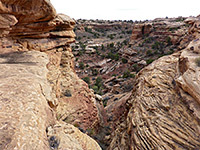 The final viewpoint, to the west, is beside Big Spring Canyon, overlooking nearly half a mile of the drainage, as it begins to cut down into the grey-green layers of the Rico Formation, which underlies the reddish-brown Cedar Mesa sandstone. The last part of the loop is further along the canyon edge for a while, then away from the rim, descending slightly to the junction near the start.